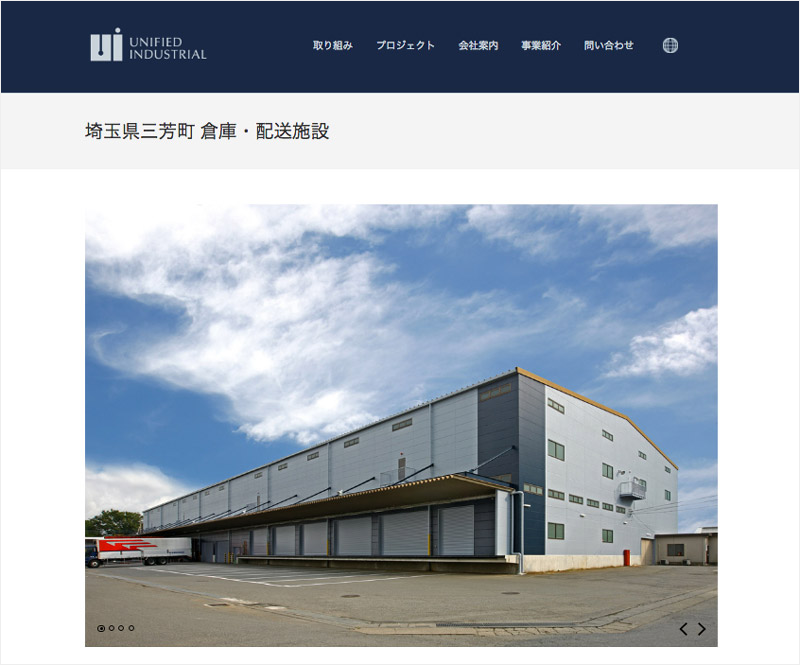 UI’s service is to find, build, and maintain industrial properties in China and Japan, which we featured on their website for UI to show clients and investors. To create this page we implemented large imagery, before and after image sliders, custom tables, and custom CTA elements to an existing WordPress theme. These aspects all enhanced the impact of the projects pages, better displaying UI’s properties in a manner that their target audience would appreciate and resonate with. 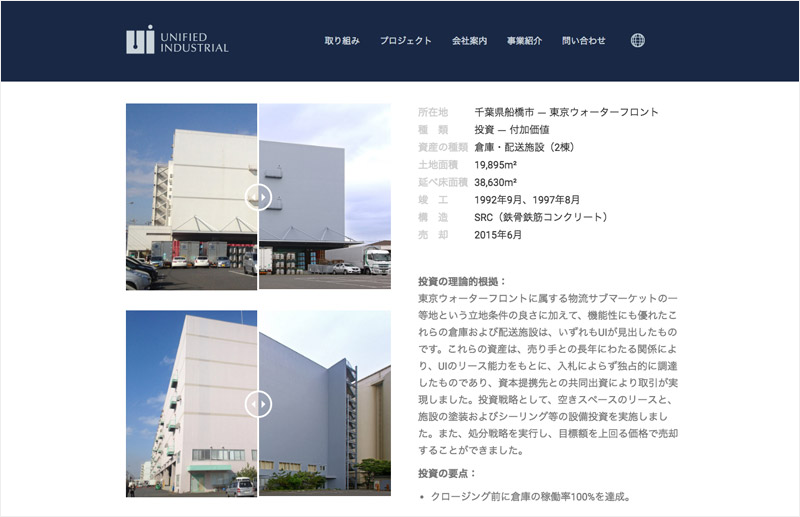 UI was connected to us via referral and was in need of an all new website to display their industrial properties in Japan and China to clients and investors. We worked together in this initial planning stage to create a website that complemented UI’s existing brand language, exceptionally displayed their properties, and resonated with their target market. We presented a selection of WordPress themes to base the existing website upon, all vetted for speed and reliability by our development team. 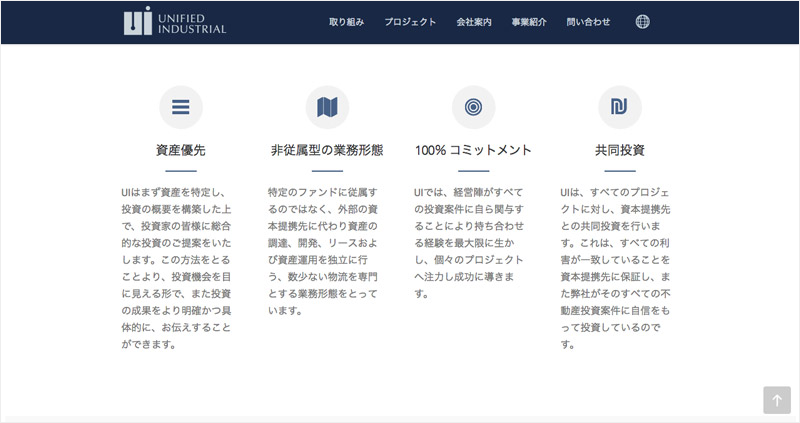 The chosen theme was selected by UI, with modifications in order to better present their properties and brand. Beginning with the sitemap, and working down to individual pages, we worked with UI to develop an effective content strategy for the website. For page content strategy, we provided wireframes to confirm where content would be placed on each page, then passed them on to the development team to create the pages after confirmation. To aid UI in writing the copy for their website, we provide a content voicing guide for their team. This guide was created to give the content writers guidelines for maintaining consistency of voice and direction when writing page content. Development began during the end of the content strategy stage, putting our plans into action as soon as they were confirmed. The development team modified the theme with custom features to enhance the appearance and performance of the website. After the site was completely built and presented, UI was given an opportunity to make final revisions to the site. After consulting on the best revisions to make, and acknowledging that their impact will be positive, we finalized the website for launch. After launch, UI also kept a maintenance package on their website, allowing them to make more revisions and receive updates on the site for usability and SEO relevance as the internet changes and evolves. All in all the project went smoothly and on schedule. UI was very flexible in the content planning and design stages and gave great feedback into exactly what they wanted out of their website and how they wanted it to be done. We are still currently working together on a maintenance package, continuing to improve their web presence for future prospects.